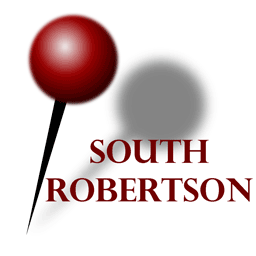 We’ve kicked off a first-of-its-kind neighborhood guide to shopping, dining, specials, news , services and more – the South Robertson App. We call it the SORO App and it is available and free free-to-download for both Apple and Android Phones. Links to both app stores are below. I live in the Pico Robertson neighborhood, which is part of “SORO.” My washing machine broke. Initially I wanted to fix it myself (it is probably not surprising that a software developer also likes to tinker with mechanical devices). I looked online for repair information. Almost immediately it became obvious what was broken (a door latch assembly – replacement cost through Amazon about $60). I even found videos showing how to fix it. Unfortunately the repair requires a special tool that I don’t have, so I called the manufacturer about getting a repair person. The manufacturer referred me to a repair company in the SF Valley – which can be an hour away depending on traffic. They wanted to schedule an appointment a week later to examine the machine. No parts would be brought, and getting the parts would take a few more days and another visit. I told them what was broken and asked them what it would cost. They replied in no uncertain terms that I am not qualified to know what was broken, and that customers are always wrong when they guess. When pressed they said the cost of the door latch assembly is $150, and the total repair would total about $250 if by some unlikely chance I was right. My search for a repair person was not over. I ordered the part from Amazon while continuing my search. On my thrid visit to Yelp I lucked out. I found Elite 7. Elite 7 is a small business owned by Tim Lubinsky, and located just a few blocks from home. I called. I got Tim. I told him about the part and that I had been careful to get the right assembly for my model. I told him it was arriving on Friday afternoon, and told him the ideal time for the repair would be Sunday. No problem – Tim was able to come on Sunday. He had the tool. He was expert. He charged a fraction of what the other people had quoted. I persisted and lucked cross the phone number for a local guy – Tim Lubinsky with Elite 7 Appliance Repair. Having the SORO app on your phone gives you special dealsaccess to The app content is evolving, with a focus on making it an essential addition to your smartphone home screen. For users, SoRo LA is a source for local information, specials, coupons, and emergency help – an essential phone app for everyone who lives in, works in or visits the SoRo area. For local businesses and services like yours SoRO LA is the most cost effective way to get your message right into your customer’s hand. SoRo app advertisement resides in your customer’s mobile phone – the device that your customers use and depend on more than any other device ever. Through the SoRo app customers can call you or write to you or get to you with a touch. And through the SoRo app they learn about your new offerings and timely specials in a timely way. Unlike print advertising platforms, the SoRo app delivers your message almost immediate, rather than a week or 2 from now. To kick start sales we’re offering amazing pricing – just $9.99 per month, or $99 per year. Pricing will be locked for 3 years for advertisers who sign up on or before April 30. Your advertising subscription includes one coupon or “specials” announcement each year. This is the lowest priced advertising available, and it delivers your message right into the hands of prospective customers. To get you listed we’ll need a few pieces of information right away. Please complete the form below as soon as possible. Later we’ll ask you to email some images if you have them available, for the graphic look of the ad, such as a square thumbnail image (preferably 200px by 200px – or larger) of your logo or other identifying image. When we receive your information we’ll send all the details, and confirm whether you were among the first 10 submissions.